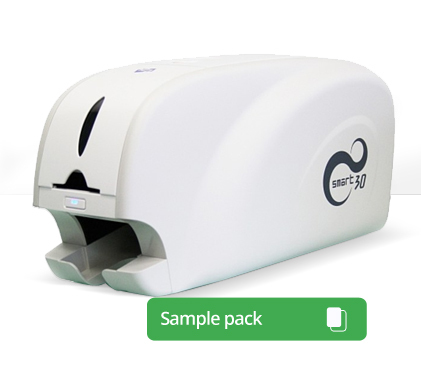 The SMART-30S is a reliable, high quality Single Sided Card printer with a USB port. Setting up this printer is easy and simple, you simply plug the printer in via USB and away you go. With the ability to produce black and white or colourful plastic identification cards and access cards; with a wide range of IDP Smart ribbons, you will be sure that this printer will produce outstanding cards to your specifications. SMART 30S allows you to print your own cards instantly and completely independently. Print your badges as and when you need them, no matter what size the batch is the quality will be just as high throughout the print. This reliable SMART 30S printer can produce your full colour ID card in just 28 seconds for only 10p! Not only is this printer quality and cost effective it is also a whisper quiet and so will not disturb any employees despite completing its job to the best possible standard. The SMART 30S provides high quality, single sided ID cards, with the ability to update it to a dual sided printer with the easy insulation of a flipper. Not to mention the first class edge to edge printing to print your card design perfectly, covering the card to its entirety. The SMART 30S is installed and used like a standard office printer. You load the cards into the input hopper, holding a fantastic amount of 80 ID cards, and retrieve them from the output hopper, both located on the front of the printer. On the front of your printer you will see an LED Button for front operation, not only improving the operation for you but also improving the overall design to create a fantastic looking printer. The SMART 30S is extremely compact which means it can fit easily into any workspace. Thanks to its light weight (3.4 kg) the printer can be easily transported. Extremely helpful and happy to give advice. New to plastic card printing we wanted a cost effective system that would get us started. The guys at Lesar took the time to go through many systems available and helped us make the right choice. When we enquired about upgrading the software again they offered us no obligation advice and when we placed the order the upgrade was with us extremely quickly. Great product, they just forgot to put the order through so I had to wait longer for the delivery. But well, we like the product and started printing already. Great customer service, knowledge and prompt delivery. Many thanks. Just to say that this was the first time we have purchased an ID printing machine. The service and advice we were given was excellent. I would whole heartedly recommend Lesar to anyone considering this type of equipment.